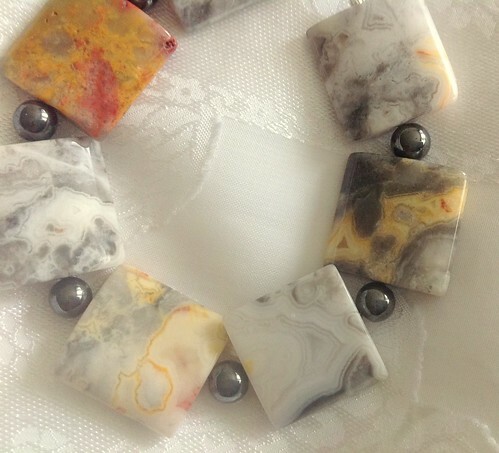 Crazy Jasper and Magnetic Hematite Bracelet, originally uploaded by Shaalom2Salaam (Safiyyah). Well, things are starting to settle down here some after all the initial buzz from the launch of the "Love InshAllah" anthology. I'll be contributing a blog post, Insha Allaah, later this month, so look for it! I'm still taking pictures. The camera on The New iPad is fabulous! As a matter of fact, the image above was taken with it. I still have to get used to it, and get better with the photo editing, but I'm happy with it. The biggest news is that I've returned to making jewelry after many years away from it. It's been a real yin and yang for me. I've written before here than I have a host of physical problems, including Arthritis and MS, Alhamdulillah. I put a lot of things on hold after the initial MS diagnosis, trying to get used to living with MS instead of giving in to it. Making jewelry is a bit difficult because fine motor control is a challenge for me, and then my hands occasionally shake. And don't forget the arthritis! Earrings are the biggest challenge of all due to all the fine motor control work, but I'm practicing. I've made a slew of bracelets, nothing intricate, but simply bead design/stringing. I think I'm ready to get more creative with the bracelets, and perhaps venture into necklaces. But, Alhamdulillah, I've been doing it! Above is an image of a bracelet I recently made. What do you think? Insha Allaah, I'm going to set up an Etsy store soon. And perhaps Zibbett, too. I plan to sell the better stuff (sterling silver and gemstone) online, and sell another line, less expensive (silver prices are through the roof!). My friends and my sisters at the mosque can also go to my Etsy store if they want to buy some of my better stuff, but I'll have other stuff available for local flea markets, etc. So, that's what's been up with me. Stayed tuned for more jewelry images! Insha Allaah!